Earlier this week, the International Boxing Federation said that IBF/IBO/WBA middleweight champion Gennady “GGG” Golovkin (34-0, 31 KOs) will need to face #3 IBF Dominic Wade (18-0, 12 KOs) next. The IBF replaced the injured #1 IBF Tureano Johnson (19-1, 13 KOs) with the 25-year-old Wade. 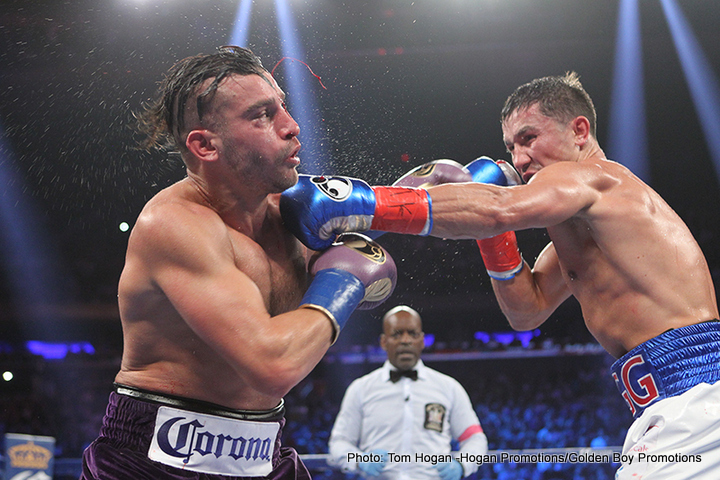 It was thought that Golovkin would be stuck facing Wade in his next fight on April 23 on HBO instead of a more interesting opponent that the fight fans would be eager to see. Wade struggled last year to defeat 42-year-old Sam Soliman by a 10 round split decision. Many fans who saw that fight felt that Soliman was robbed. Wade looked very poor in that fight, and definitely not someone that you would like to see fight for a world title against the best middleweight in the division in Golovkin. “I’m not sure yet,” Golovkin’s promoter Tom Loeffler said to RingTV.com when asked if Wade will be Golovkin’s next opponent. “No, just looking to put the best fight together for ‘GGG,’” Loeffler said when questioned about whether there are other opponents in the running for Golovkin’s next fight. owever, Saunders doesn’t seem to be really to face Golovkin yet, and making a fight with him may prove to be impossible. It’s not impossible, but it would likely take a lot of money to get him to agree to the fight. Golovkin and Loeffler probably don’t have the kind of big money that would be needed to lure Saunders into accepting the fight. “We sold more tickets with this kid from Kazahkstan in New York against David Lemieux than they did for two middleweights from Brooklyn, (Daniel) Jacobs and (Peter) Quillin and the heavyweight championship fight (between WBC titlist Deontay Wilder and Artur Szpilka) in Brooklyn,” Loeffler said. Golovkin can certainly sell tickets, but it probably won’t help him get guys like Jacobs, Saunders, and Quillin to fight him. If Golovkin could bring in a lot of PPV buys on HBO, then that would make things a lot easier to get the big names in the 160lb division. Golovkin is targeting WBC middleweight champion Saul “Canelo” Alvarez for later this year, but it remains to be seen whether that fight is going to happen.